The Dakar Rally: Three weeks and 5,500 miles of off-road racing all over South America. It's an epic battle of trucks versus cars versus motorcycles versus a smattering ATVs: think Mad Max with energy drink sponsors. And I'll be chasing the whole thing with a team of 4x4s and dirt bikes. We're not racing this time. We'll be running behind, beside, and ahead of the competition in our own rigs like a bunch of wacky hippies following a band, drunk on diesel and high on adrenaline. I'm teaming up with an Argentinian off-roader I've never met and legendary Australian adventurer Magnus Eriksson to lead a multinational crew of off-road enthusiasts from Buenos Aires to Chile, up into Boliva, and all the way back down again. Eriksson and I have ridden together before. He runs a tour outfit called Outback Adventure Treks based down under; taking bikers on off-road tours all over Australia's most extreme unrestricted playgrounds (read: merciless desert wastelands), to the world's highest roads in India, and now: to South America in pursuit of the Dakar. I spent 2011 driving his support truck, riding point on motorcycle, cooking, camping, and keeping about ten tons of equipment running through days of desert abuse. At the end of the year I came back from Australia with enough stories for a novel and a permanently misshapen skeleton from a high-speed collision with a kangaroo. Can't wait to get back on the trail and get a few thousand more grueling miles under my tires. 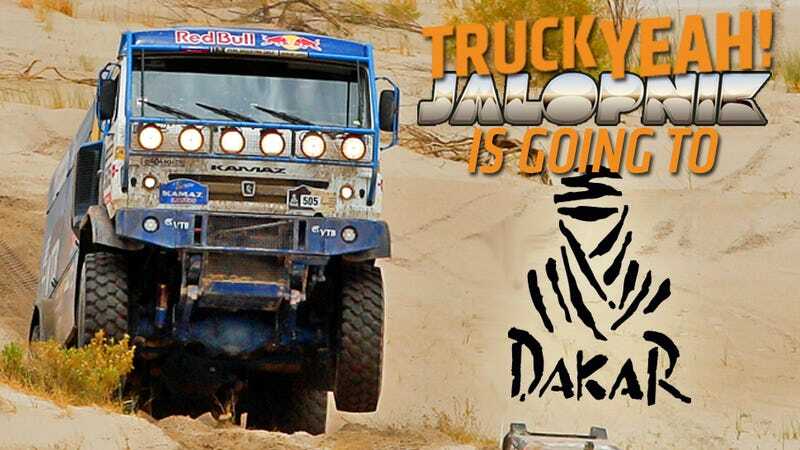 I don't know how often I'll be posting over the next month, or if I'll bother coming back (I hear it's easy to buy a diesel manual pickup down there), but bookmark the "Chasing Dakar" tag now and check it often for trailside updates! In the meantime, as me anything!